Uniforms give a professional appearance to any business. However, it’s especially important for restaurants to maintain a professional look. With so many places for people to leave feedback online about your business—Yelp, TripAdvisor, and Google to name a few—you want to make sure you have all the tools necessary to receive positive reviews. People in Baltimore are also picky about where they eat; they want to know the restaurant they are eating in is clean with good service. We unconsciously think the food will be good based on the server’s clean, professional restaurant uniform. This is where restaurant uniforms come into play. 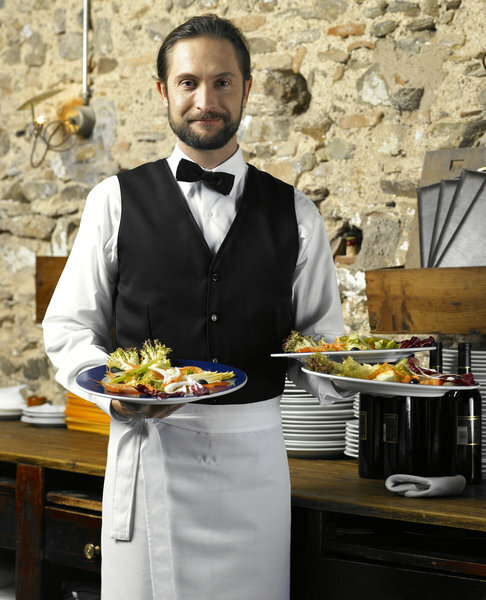 Uniforms play a big role into maintaining appearances for restaurants. Beyond the online reviews, a restaurant is judged by its staff, and before your staff can even have a chance to make an impression through contact, they are making an impression with their outward appearance. If you’re interested in making sure your staff is making a good first impression on your guests, consider the following benefits uniforms can have. Whether consciously or not, we all make some judgments of a restaurant based on how their staff are dressed. If they are wearing dry-cleaned vests and dress shoes, you assume the restaurant is upscale and ideal for client meetings and anniversaries. If the staff is in jeans and a t-shirt, you assume it’s a casual place you can bring your friends or co-workers for happy hour. Because employees are one of the first things people see to form an impression, their appearance makes a big difference. Restaurant uniforms ensure everyone is portraying the ideal look for your business. If you require employees wear their own dark jeans and a black collared shirt, that still leaves room for variation, which isn’t always good. People notice inconsistencies in appearance, and one person’s idea of a black collared shirt and dark jeans may be considered sloppy or inappropriate. Uniforms eliminate these inconsistencies, and put all of your employees on the same page for appearance. Another thing people unconsciously do is associate a business with its staff. Uniforms with logos, writing, or other accessories that grab the guest’s attention create memories. You want them to remember your restaurant, and giving your staff restaurant uniforms gives your guests another thing to remember you by (other than the awesome food!). Hats, aprons, shirts with quotes, and other uniforms and accessories add character and identity to your restaurant. With so many dining options in the city of Baltimore alone, you want to help yours stand out in any way possible, and uniforms are a great way. For over forty years, Lord Baltimore has provided reliable, cost effective uniform purchase and rental services throughout Maryland, Washington DC, Northern Virginia, Southern Pennsylvania, and Delaware. To learn more about how Restaurant Uniforms can give your restaurant a positive image, please contact Joe Bateman at Lord Baltimore by calling 800-292-1224. This entry was posted on Thursday, October 29th, 2015	at 7:33 pm	. You can follow any responses to this entry through the RSS 2.0	feed. Both comments and pings are currently closed.